You are here: Home / News / Harvest Time! It was really nice to see so many CSA members at the farm two weeks ago for our open house and barbecue. Thank you for coming! It feels really great for us farmers to be able to show our members where your food comes from and share firsthand a little bit about how we do what we do. We are at about the half way point in the summer share and it really feels like it in what we are harvesting from the garden. It’s a good time to give you a glimpse into what a harvest looks like for us and how we actually get the food from out of our field to you. Harvest mornings start at 6am with the crew meeting in our big shed and loading our harvest truck with bins, knives, digging forks and whatever else we need to pull veggies from the field. Then we head into the garden. Each harvest starts with greens and other veggies that are most susceptible to heat and want to be taken out before the sun’s rays start to warm them up. So lettuce and kale, arugula, herbs and other greens get loaded up first. These are primarily cut with knives and packed into bins then loaded onto the truck. Then we head to onions and carrots, potatoes, green onions and other crops that like the cold, wet morning and bring those into the shed as well. We leave the fruited crops like tomatoes, zucchini and cucumber to the afternoon or late morning when the dew has past. These crops get harvested 3 times per week (Mon, Wed and Fri) – picked, sorted, and packed to be distributed throughout the week. Once the veggies are in the shed, one person starts the washing and packing while the others bunch, clean and prep things before getting dunked or sprayed down. These crops (like carrots, onions, green onions, beets etc) get prepped then passed to the washer who washes, counts and moves everything into the cooler. 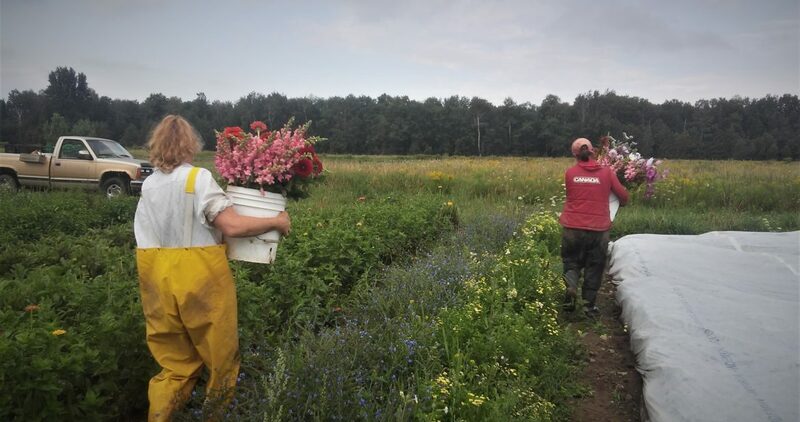 Usually the bunching crew then heads out to pick other things like beans or peas, eggplant or peppers, things that don’t need washing and prefer being harvested when they are dry of dew. These things then get sorted and binned, weighed and put into the cooler. The cooler is packed strategically so that whoever is attending the CSA pick up can just grab everything and go. Harvest is the reason we do everything on the farm and harvest mornings are intense, fast-paced and can be exhausting. But they are also when we get to revel in the beauty of the crops, get excited about what we are bringing to our members and sample the wares!